11) Elizabeth York, age 1, born NC. 12) P. J. Teague, age 1, male, born NC. 11) York, Elizabeth, 20, works in cotton mill, born NC. 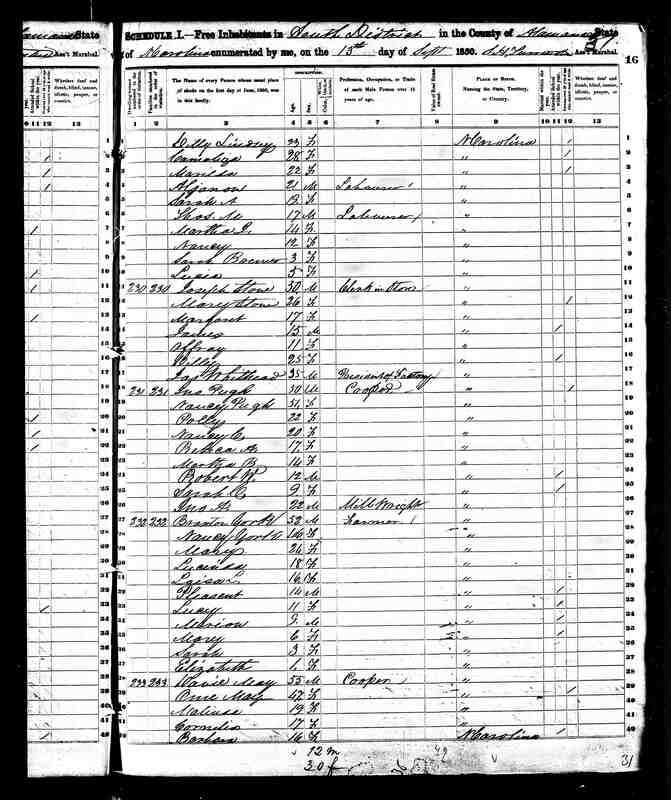 9) Thompson, Mary, age 17, born Apr, boarder, works in cotton mill, unemployed 12 months, born NC, parents born NC. 8. Story, 1890, Saxapahaw, Alamance County, North Carolina, United States. 1888 Prominent members of the founding group of the Saxapahaw Union Church, which later became Saxapahaw Methodist Church, were William F Lindley, Joseph D Bacon, and Nancy Teague. 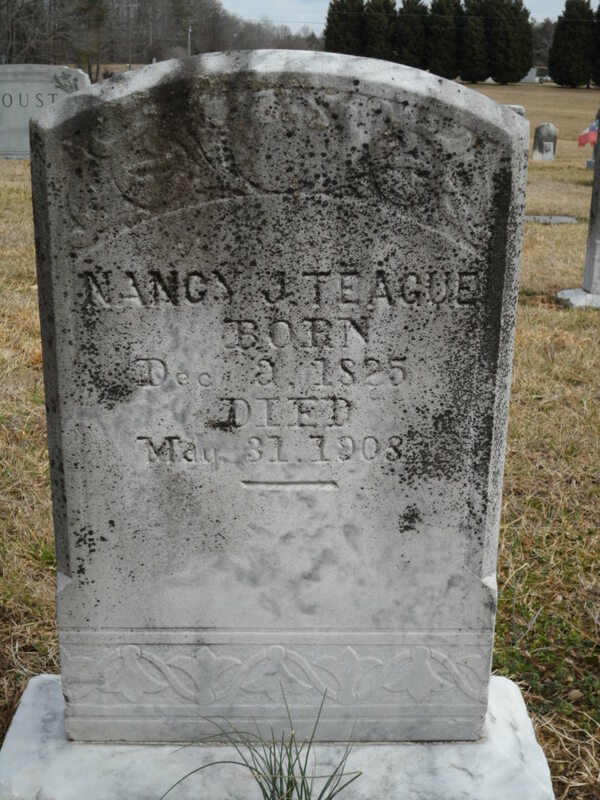 1) Teague, Nancy J., head of household, born Dec 1824, age 75, widow, 5 children, 4 living, born NC, parents born NC, can read and write, owns her home free, house is on Dixie St.
5) Horn, Hattie, boarder, born Jun 1897, age 2, born NC, parents born NC. 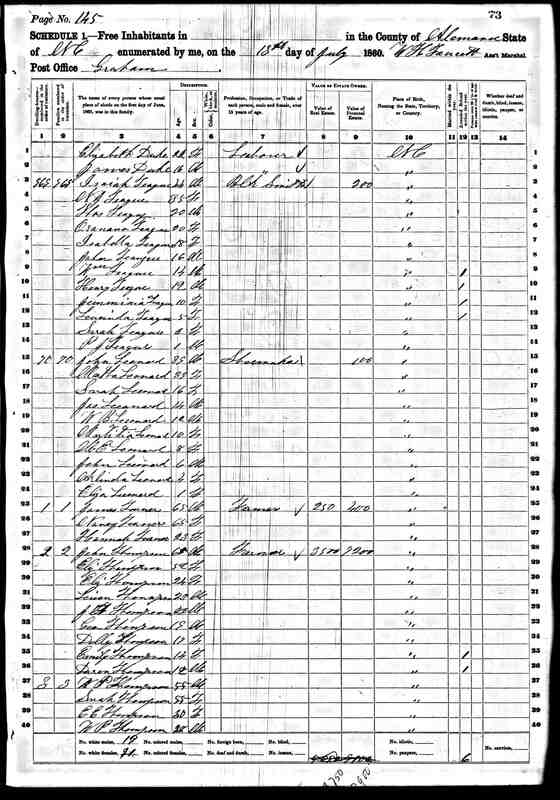 NC Marriage Bonds lists a Nancy Jane Rollings, who marries William Milton York on 31 July 1851 in Randolph County (bond number 115386). A better possibility is Nancy Myrick, who marries William Y York on 30 Aug 1846 in Randolph County (bond number 115389). 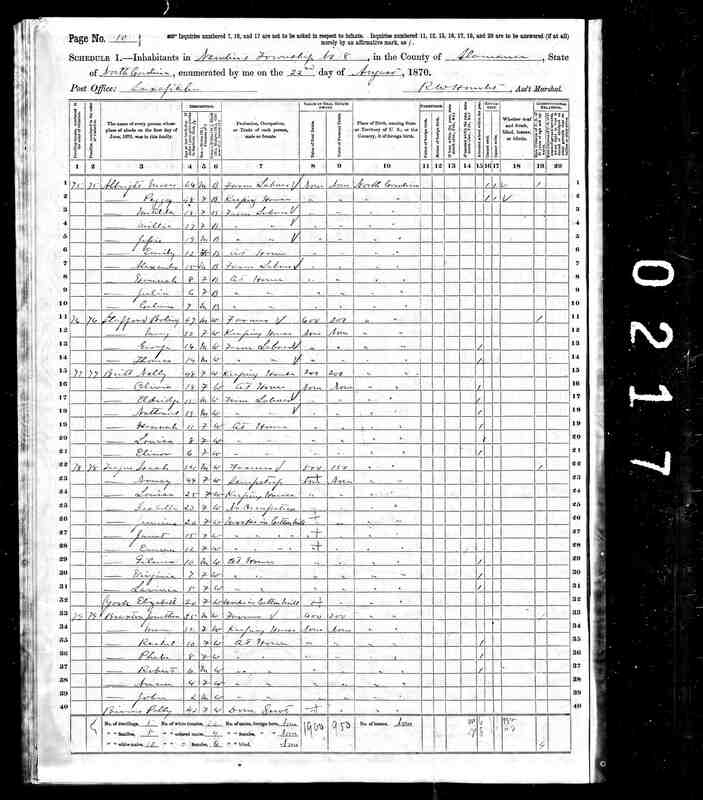 William Y York is shown living by himself in the 1850 Census, age 27, millwright (Randolph County, Northern Division, p212). 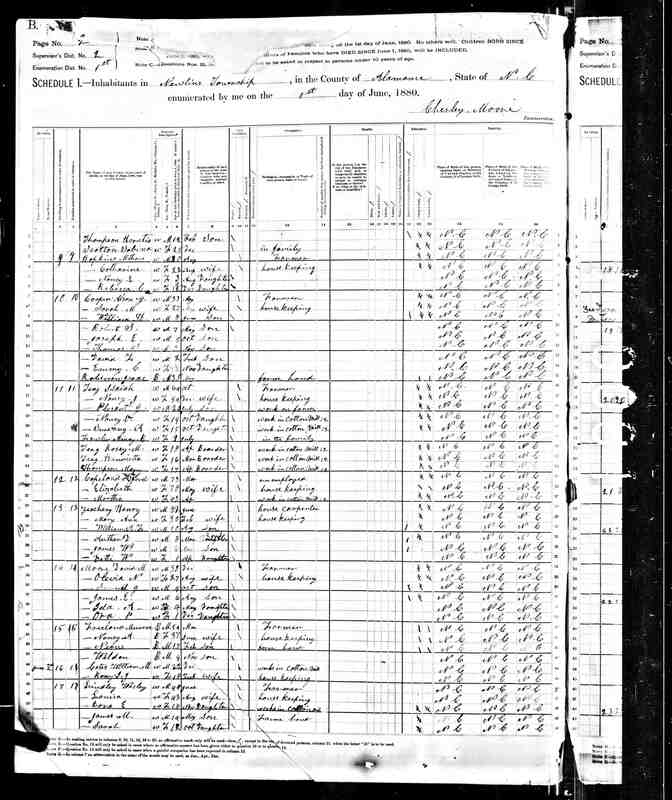 He is not listed in the 1860 Census. In 1850, William Y York deeds some land in Randolph County to John B York. In 1852, Randolph County deed book 28, page 509, says that William York is deceased, and his land was sold on 23 Apr 1851 as a result of a Court of Equity decision in the Spring Term 1851 . The court approved the sale in Fall Term 1851, and the deed was transferred to Semore York on 23 Mar 1852 for $209. The land was on Reed Creek in Randolph County. Seymore York sold the same property to his son William H York on 7 Dec 1852 for $350 (deed book 30, p128). The Equity Court minutes, p403, 4 March 1851, state that an affa davit was filed by two York family members requesting that some land belonging to William York be divided, but the court said they could not be divided without injury to one or both of the tenants, so the judge ordered the land to be sold. There was no will for William Y York found in the Randolph will index. All this seems to create an unmarried Nancy (Myrick) York as of William Y York's death around 1851 . No Myrick wills have been found in Randolph county that might refer to Nancy Teague or Nancy York. There is no record of Isiah Teague found in Randolph county. 1. Story, 1854. 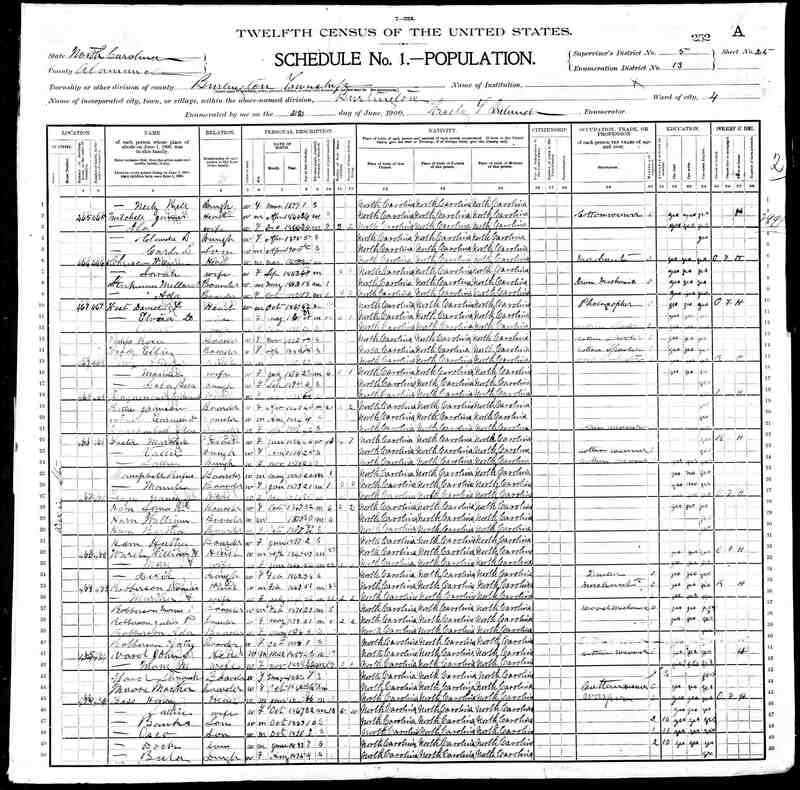 According to Teague Family Index on web (www.seankell.com/familytree/teague), Isiah Teague, son of John and Anna, m2 1854 Nancy York.